We hadn't seen much from John Burroughs sophomore Brandon Miller so far this season. But what we had seen was but a precursor for what was to come this weekend. After cruising through the district meet in the 1600 and 800 and helping his team in the 4x400, Miller said he felt really strong and had been focusing on speed development heading into the sectional meet. 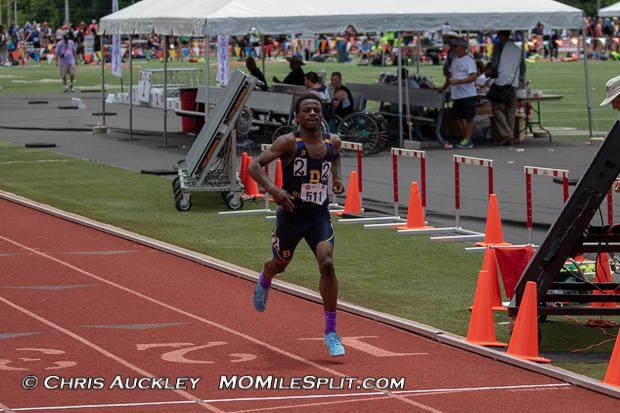 Once there, he decided to give us a taste of what he might be bringing to state with his 1:51.82, a top 25 mark in the US at the time. That season best would not last long, though. But, in all honesty, were you surprised? After a morning rain delay pushed the start of the meet to 1:00 pm, that meant the 4x400 was probably going to be run at dusk. Under the lights and the sunset, Miller finally popped out on the track to anchor his squad to a heat 2 victory in an insane 47.14 split. 47.14 is, after this weekend, a US No. 26 open 400. The 800 would be his third event of the weekend as he had to first compete in the 1600. Miller headlined a strong field made up of two-time 1600 champion Stephen Kielhofner, Loki Cortner, Kolin Overstreet, and many others that all decided to make it a tactical race from the get go. Miller sat and waited in third as Kielhofner and others moved in and out of the lead. Biding his time and saving a little for the 800 later, Miller finally made his move with around 250 meters to go, throwing down a 59.13 last lap that was most closely answered by Cortner's 61.81 that moved him into second. 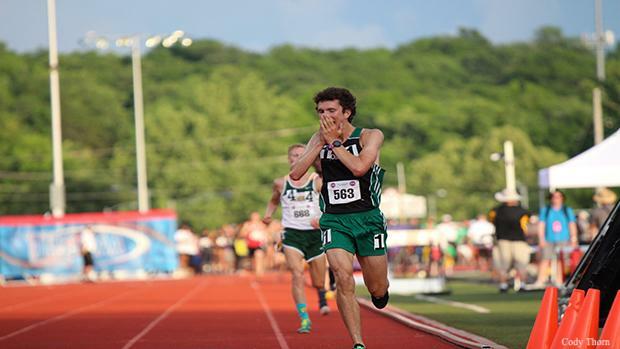 Miller would go 4:23.00 - a new personal best - and win his fifth career state title. Kielhofner would finish third with Overstreet fourth and Jacob Coffman fifth. You could feel the intrigue starting to build as the 300 hurdles came to a close. As Miller stepped on the track, there was little doubt in the crowd that he would lose - the only question was how fast? At the sound of the gun, Miller stormed out to his rightful place out front. As he moved through the first 200 in 25, one could instantly sense that something special was about to happen. Miller's lead was already 2.5 seconds as he came through the first lap in 53.54. Corben Clubb led the chase pack with St. Pius X (KC)'s Joseph Lynch, both under 57, no doubt pulled along by the 53 ahead of them. Miller rounded the corner and hit the back stretch as the crowd began to rumble. The lead almost instantly doubled in size as his smooth, strong strides ate up track at speeds once thought unattainable in the state of Missouri. He did not see 1:30 on the clock until he approached the last 100 while the rest of the field was just passing through 600. Now the crowd rose and the once-scattered masses of cameramen and women lined the infield snapping pictures of what was shaping up to be Missouri history. Miller crossed the line in a new US No. 2 1:49.55, a number that will go down as the fastest 800 meter time ever by a Missourian in high school. It was a personal best for the sophomore by .32 seconds, a much larger number for someone of his caliber than it may seem for others. 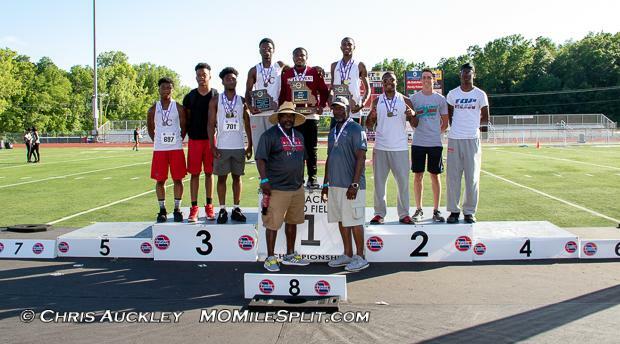 The national record holder for 8th and 9th graders still has about a second and a half to grab the record for 10th graders, but he still has a lot of season left. 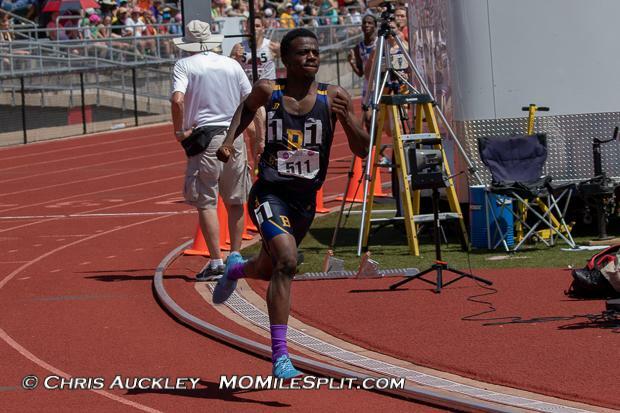 He was also .01 behind Charles Jones's 1:49.54 from the 2014 USATF Junior Outdoor Nationals, but that was post-graduation. 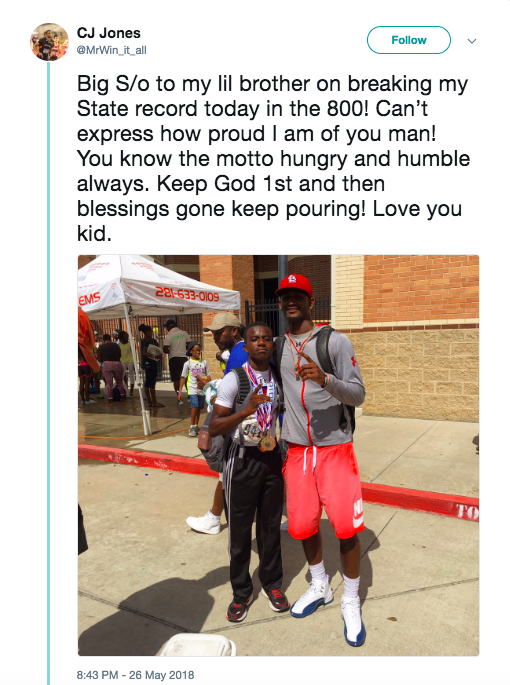 Jones also gave some love on twitter to Miller after breaking his Class 3 record. Not to be outdone, Miller would come back later that night to anchor the Burroughs 4x400 to a second place finish. His eye-popping 46.89 took the Bombers from fifth to second, but was not enough to overcome the Southern Boone anchor's 48.1 split. 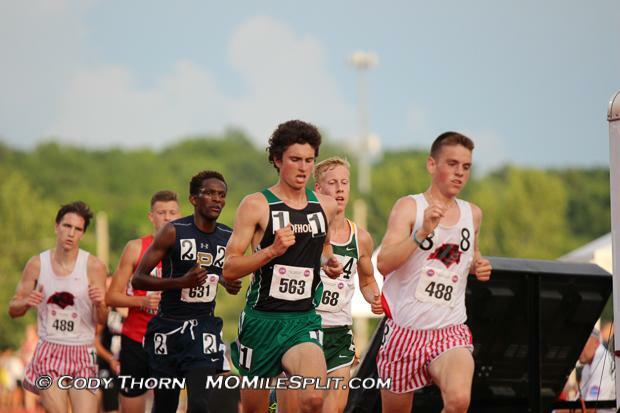 All in all, Miller capped off a short, but stellar MSHSAA competition season by breaking a 31-year-old state record, but there is still much more to come starting with another 800 Thursday night at the Festival of Miles, which you can watch live on FloTrack. Sometimes all it takes is a change of scenery to affect serious change in one's fortunes. 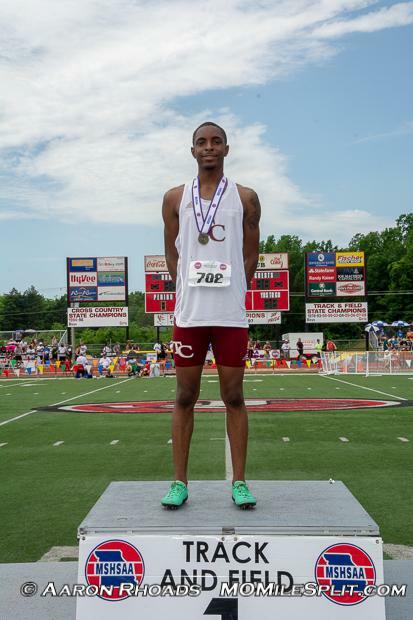 For Trinity Catholic junior Kemeric Winston, the move from Hazelwood Central to Trinity was one that was motivated by personal reasons, but the move proved fruitful as Winston was able to grab victories in the 100, 200, 4x100, and 4x200 as the anchor on both relays. "My coach just told me to pull the trigger," he said after his 100 meter dash victory in 10.86. Winston pulled the trigger in the 4x200, shooting around the final curve and pulling off the come from behind victory. He came back about an hour later to power home for the 4x100 and then outlasted Jameson Williams and Grant Conway to pull in his fourth gold with a 21.48 200. "I'm actually shocked that I won," remarked Winston after the 100. "I can't thank (anyone) except God, my coach, and my mom. I'm just blessed." 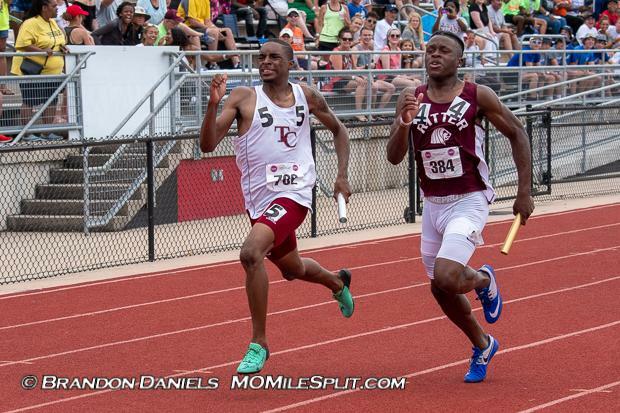 Only a junior and a part of a program that is gaining steam, Winston should be one of the heavy favorites to repeat in the sprint events next season, though he could see challenges from either Williams or Hasani Barr, both of Cardinal Ritter, and Conway as he returns next season, too. It's not an easy double. In fact, most people would call it an impossible double. 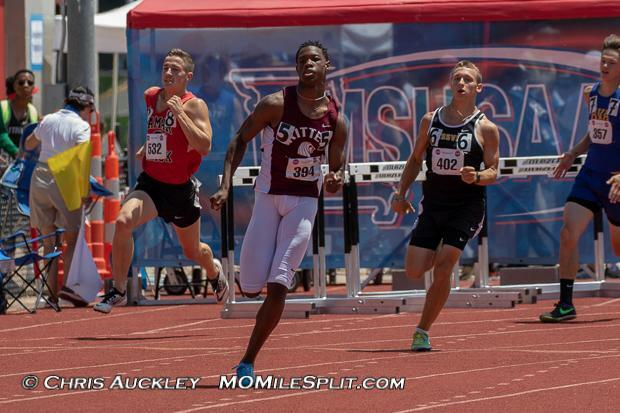 The Cardinal Ritter junior turned some heads when district entries were released and he was shown to be entered in the 100, 400, 300 meter hurdles, and 200. Four open races for the team's superstar, but he told MoMileSplit that he was doing it for the team. "This year I wanted to win state as a team, my school hasn't done it in 20 years, so I tried to get as close to 40 points as I could." Kemeric Winston would keep him from scoring 40, but Williams was still able to grab 36 with victories in the 400 meter dash (48.68) and the 300 meter hurdles (37.47), running 49.15 and 37.79 in prelims. He settled for second in the 100 (10.94) and 200 (21.53), but his 36 points would help the Lions pull in the team trophy. For as good on the track as he is, though, Williams is even better on the football field. The four-star wide receiver recruit plans on "taking a football career" after high school, but he also said that "it's not set yet." He still has one more year to dazzle us on the track as sprints fans should look forward to his talents in 2019, as well. He may have been the nicest kid on the track during Friday's 3200 (which is saying something with the young men against whom he was racing), but when it came down to it, Maryville senior Caleb Feuerbacher was anything but charitable. With 600 meters to go, Feuerbacher felt the ice in his veins and was able to turn on the jets when it mattered the most to grab his first career state championship in a 6-second personal best and 20-second season best of 9:35.21. As soon as he crossed the line, though, he was back to his old self, with hugs, ear-to-ear smiles, and congratulations for all of his fellow competitors. "It's been a culmination of so many years of hard work..." he mused after this race. "Grabbing (gold) and ending my track journey with a first place medal, I couldn't dream of anymore. It's amazing." Feuerbacher was one of a number of boys who would lead in this one. 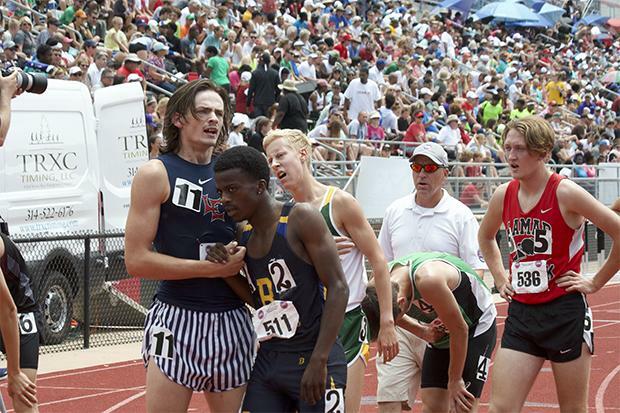 In fact, as late as 2400 meters, there were ten boys within four seconds of each other before the race broke open. Loki Cortner, Stephen Kielhofner, Jackson Conner, and Jonathon Coffman all has their time up front before Feuerbacher eventually made his move. It was a foot race with 400 meters to go between him, Kielhofner, Principia's Simon Karega, and Coffman, but a 63.15 final lap was the key to Feuerbacher's win. "I just went all out from 600 to go, I said 'I don't care, I'm just going to move...' I could not believe it when I crossed the line; I burst into tears." Feuerbacher now heads to UMKC where he will be studying in the six-year medical program. Peyton Davis "Hits For the Cycle"
His coach called it "the cycle," we called it a "flush," but whatever you call it, Centralia junior Peyton Davis's weekend was one that we don't often see as he took first, second, third, and fourth in each of his events. A known multi-event talent, Davis had to condense his prowess across nine different events into just four for the state series. He went with the javelin, high jump, long jump and 300 meter hurdles. 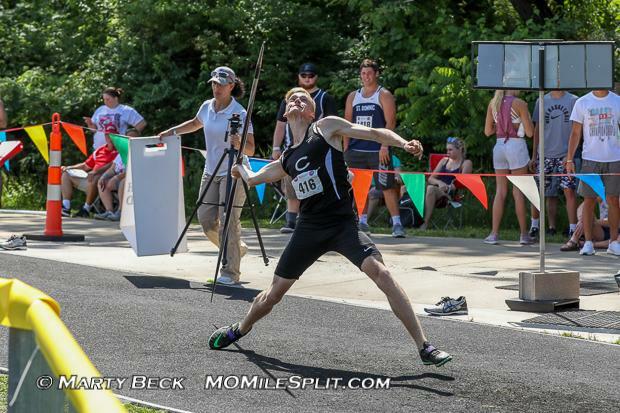 In the javelin, arguably his best event, he smashed the field throwing a Class 3 state record of 186-11. "I decided not to think about anything and just go in there and just kinda yank one and see what happened so 186-11 first throw...I was happy with it." It was a busy day for Davis, though, as he was not even nearly done after that. His second place finish, though would come in his last event: the high jump. Davis was one inch off his 6-6 personal best, but was able to settle for the runner-up finish. Duchesne's Mitchell Fairless would win the event in 6-10. His third place finish came in the long jump with a 22-1.25 leap. After setting his personal best of 23-1 at last weekend's sectional meet, he was unable to improve upon that mark here, but was still able to grab a high finish for the Panthers. Clinton's Trey Miller won by a foot and half, jumping 23-7 for a big victory. His fourth place finish came in a hotly contested 300 meter hurdles race. As previously mentioned, Jameson Williams would take the victory. Grant Conway and Chillicothe's Brett Shaffer both came across in 38.05 and 39.12 respectively, but Davis was able to grab fourth in a personal best 39.55. When asked about how he decided between the events in which he would be competing, he said it came down to the timing of each event at state and that this schedule worked out perfectly for him. "It's worked out pretty well so I'm happy with the decision making," he told us after the high jump. 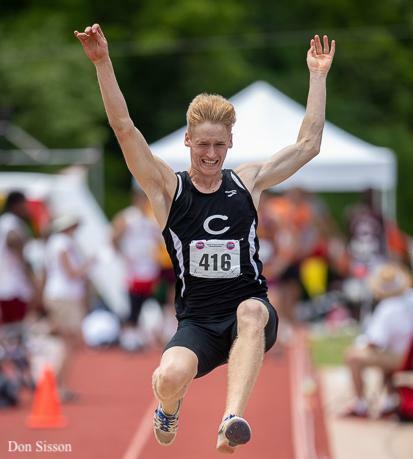 He's headed to the Great Southwest Classic and is just looking to "have a good time" in the Decathlon before he heads to junior nationals in Indianapolis. Boys Pole Vault: Bryan Candrl (Owensville) won the event in 14-9, just ahead of the 14-6 clearance from sophomore Jake Freidel (Father Tolton) and 14-3 from his Owensville teammate Jacob Luther. Boys Triple Jump: After finishing 3rd in Class 2 last year, Rasheed Ricketts moved up and jumped 47-4.5 in the Class 3 triple jump, his first outdoor clearance of 47-0 (he had accomplished the feat this indoor season already). Boys Discus: Lamar's Cooper Lucas repeated as champion, but this time he had to throw 16 feet further as his 176-2 was a new personal best and a mere 2.5 inches ahead of Chillicothe's Walker Graves. Boys 4x800: Principia was the only squad to go under 8:00 as their 7:59.40 netted them a victory over Stockton. Nathan Babcock split 1:55.75 on Prin's anchor leg. 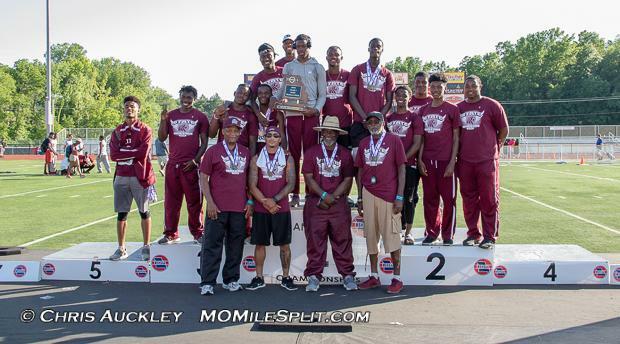 After finishing a mere two points out of a medal spot last season, Cardinal Ritter was able to put it altogether in 2018 and pull off a convincing victory in Class 3. Of course, Jameson Williams grabbed half of those points by himself, but Lee Steward, Rasheed Ricketts, Keven Lomax, Breon Mosby, and all their relay members all played a hand in the victory. They scored points in the 100, 200, 400, 300H, 4x100, 4x200, 4x400, Long Jump, Triple Jump, and High Jump. 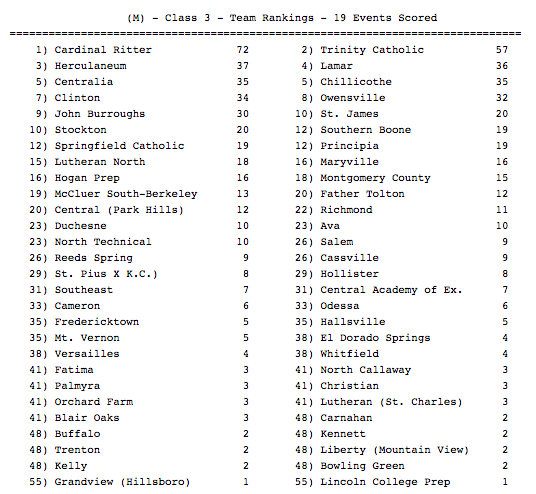 Trinity Catholic got 20 points from Kemeric Winston and another 20 points from him and the 4x100 and 4x200 relay teams. Isaiah Williams took fourth in the long jump and fifth in the triple jump and freshman Malcolm Harvey heaved a US No. 10 Javelin mark of 163-1 for second. They had a number of underclassmen qualifiers who did not score points for them so look for it to be a major battle between Ritter and Trinity next season as both teams return a vast majority of their high profile athletes. Herculaneum and Lamar both grabbed the final two spots on the backs of their distance programs, but the afore-mentioned Cooper Lucas helped Lamar with his 10 points in the discus and while Jonathon Coffman, Corben Clubb, and Loki Cortner did the heavy lifting for the Blackcats, Herky also got two points in the pole vault from James Moloney.